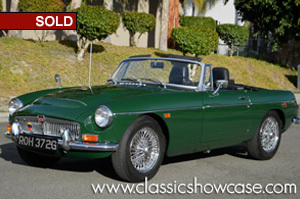 This MGC Roadster is great example with low original miles, and has benefited from a documented history of exceptional maintenance and care; coming in an attractive color combination of British Racing Green over a black leather interior, the car was sparingly driven, primarily used for leisurely touring. The MG received a repaint to it's exterior and includes an extensive binder of documentation covering the history of the car, including: the original sales documents and purchase order, all correspondence with British Motor Corporation, dealer brochure, service records, factory shop manual, factory parts manual and tool kit. It should be noted that less than 9000 of these models were built, with very few residing in the United States; as such, this MGC is sure to be a standout at future British car themed events. Whether you wish to show or drive the car, this MGC is ready to be enjoyed by seasoned and new collectors alike! Conceived as replacement for the aging Austin-Healey 3000, the MGC debuted in 1967 powered by a 2,912cc, six-cylinder, seven main bearing power plant. Persuading the larger engine to fit into the MGB resulted in a number of changes, not the least of which was the adoption of a new front cross member and torsion bar springing for the front suspension, while the bonnet was given its characteristic bulge. The 'C' excelled as a Grand Tourer, its high axle ratio - 100mph equating to just 3,750rpm in overdrive - making for effortless high-speed cruising. The MGC model lasted for just two years, production ceasing in 1969 after around 9,000 cars had been built.